On 4/11/1976 Dr. Harry G. Lee discovered a few Daedalochila auriculata, including at least one live specimen, near the Munsilna McGundo House, located near the intersection of Ft. George Road and Palmetto Avenue on Ft. George Island in far northeastern Duval County. Over the next 37 years the location was periodically surveyed by a variety of individuals and no additional specimens were found. However, finally on 1/7/2013 this reporter discovered a single live specimen beneath a dried palmetto frond in the roadside swale on Palmetto Avenue about 200 yards from Harry's previous find. 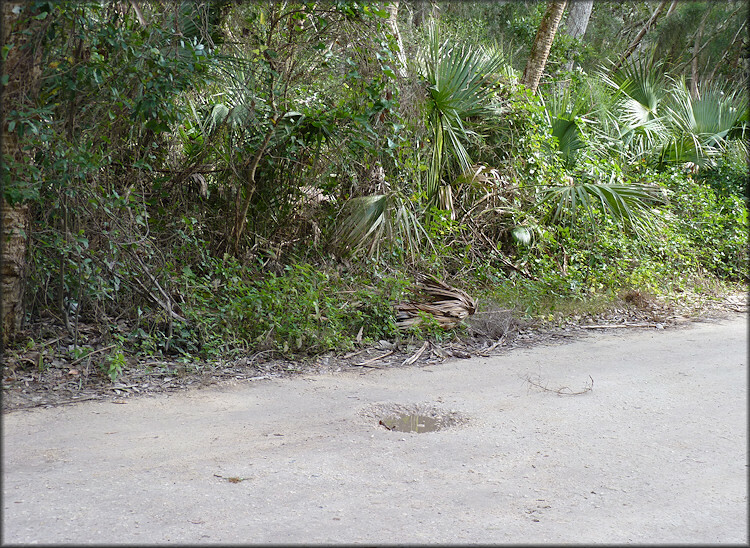 On 1/20/2013 during a return visit to the area an additional four living specimens were found - once again in the roadside swale under dried palmetto fronds but not in the same location as the earlier find.